Instead of fiddling with the hands and pulling the head of the horse down in order to get it to "round and engage", you can teach the horse to "engage from behind and consequently round", and begin teaching this work from the ground. It is so much easier for the horse to keep his balance and to actually understand what you want if you show him this way, and it is much easier for you to develop a feel for what you should be doing, rather than manipulating the head position. You can see what the horse does, you can learn the sequence of footfalls and point things out to him with the stick. The horse is unencumbered by your load and your shift of balance. It's a nice, slow warm-up for everyone involved. Imagine my surprise when I, as an attendee of a clinic with baroque rider/trainer Bent Branderup witnessed him doing exactly the same thing as my teacher has taught me to do with horses that have not yet learned to engage and search the bit forward-down-out. What I had been taught was no "dirty trick" that she had invented, but something universal even used by a student of the Jerez School, von Neindorff and Oliviera. He used it on an unridden 3 year old arab gelding that hadn't a clue, and within minutes this horse stepped under and stretched his topline into relaxation. whip end as a whip. I do it on any kind of horse, if they don't know how to search the bit - warmbloods and reschooled trotters, shortbacked and longbacked, hot or lazy. It teaches the very basics of lengthening the frame from behind, releasing the back and staying in balance while doing so. I do it particularly on horses that are tense in the beginning of the ride, who appear to have something bothering them about their backs (which of course should be investigated by a vet, but if the problem persists). I like to warm up all horses I ride with my weight off the horse, and the horse stretching the back out and bending in walk. There is no better way than the shoulder-in volte. In this example I show the shoulder-in volte to the right. If you and your horse are new to this, you should instead start with the shoulder-in volte to the left, because you will then be on the familiar side of the horse. The horse will easier understand you when you are on the familiar side. In the shoulder-in volte to the right, as in this example, you stand on the horse's right side, and hold your whip in the left hand, as if you were about to lunge him. Hold the reins at the end, with a straight connection to the inner bit-ring and let the rein from the outer bit-ring run along the side of the head and over the poll and rest behind the ears. Hold both reins loosely, but not slacked. Ask the horse to walk around you on a volte. Holding the reins this way, you can have contact with both sides of the mouth, and it gives stability to the bit so that the bit will not be pulled out of the mouth in either direction, should the horse move his head inadvertently. Lunge the horse on a small volte at the walk. Take care to let the horse walk slowly and rest on each step. Bending along the track is less important, as is positioning. If the horse does not understand and turns on the forehand to face you, you can start by leading him along the volte, until he gets it. Don't aid every time the horse lifts the hindleg. He will quicken the pace if you do, and eventually start to trot. You just want a longer, more engaged step. Move the forehand in towards you. When the horse understands this, the real exercise starts. 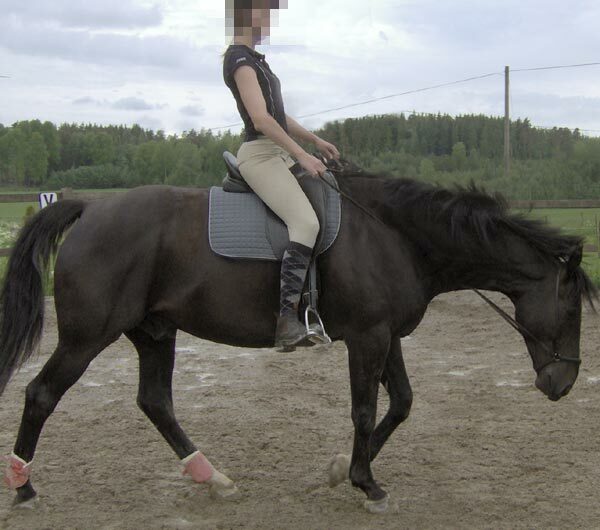 When he engages the inner hindleg more, you can start to move the shoulders in. When you do this you make him tread further in and towards the middle line of his body with this leg. This makes him load the inner hindleg and stretch the topline over the croup. You move the shoulders with your reins. Make sure your horse does not just bend the neck to the inside, but moves his shoulders towards you. You aid with the reins as the horse has the inner fore in the air and the inner hindleg has just landed. You can also give a bending aid with the whip handle, if you can get the timing right. Make sure the horse continues forward, and doesn't start turning on the forehand. Ask for little, and reward. When this works, try to achieve a slight positioning inwards. But don't let it block the hindleg. The horse releases his back when the inner hindleg is engaged. Because the horse takes more weight on this engaged inner hind, he will rotate the pelvis to a more vertical position and lowe his inner hip. This pulls on the L-S joint and arches the back from behind. It also stretches the outside back muscles and the horse now wants to continue the stretch by lowering his neck and relaxing his jaw. It is important that he chews, but remember that the chewing does not come from the mouth, it comes from the hindleg. Don't start fiddling if he doesn't chew. Just keep up the work. If he does not stretch, you need to check the timing of your aids, or the forward urge of your horse. If he is not forward at all, you can lunge him at trot or canter with only one rein attached, to wake him up. If he is forward but does not understand, you can try to position him to the inside gently, with a vibration of the inner rein. It is vital that the vibration is short, and must not become a restraining aid, since we want the horse to stretch, not to shorten. Some horses stretch to the ground the very first time, in a matter of minutes. Some take a bit longer. Long backed horses have a harder time, and generally don't stretch as far until they have practiced some. Remember to change rein and do this in both directions, and DON'T OVERDO IT! The horse must trust you with this. When your timing and his understanding/balance has improved, you can do this from the saddle, to get him used to the feeling of carrying you on a relaxed back. Drive the hindleg under and towards/across the midline. Position to the inside at the poll. Drop the outside rein completely. 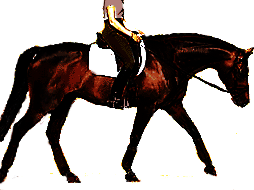 You must drive the lifted inner hindleg sideways when it is lifted. This is basically so when the outside fore touches down. Nudge, then, don't squeeze, since squeezing makes the horse ignore it. The inside fore will be back and under the body. The inner hindleg should land on or beyond the midline so the hindquarters sway out. Don't worry. Position to the inside with the inside rein by opening the rein to the inside, NOT pull back. Remember to ask for a give in the jaw and immediately release. Repeat if necessary, just don't be left hanging there. If the horse overbends in the neck, it's still ok. He will learn sooner or later. Horse stretches the reins down at walk. It is very important that you are quick in the hand, and that you release the rein as the horse wants to stretch. A lot of riders are so used to riding with clenched fists around the reins and heavy contact, that they have no feeling in their hands. If you ride with a constant pull on the reins, the horse's release will cause you to jerk the rein back, and he will be punished for releasing, so you better get lighter hands. Don't turn into those people who slop the reins around and don't dare to touch them. To get position in a horse that is slopping around, you may have to do a "come to jesus" with a fair amount of pressure. That's OK as long as you release when release is due and not 2 seconds afterwards. The horse's release of the jaw and poll should flow seamlessly into his stretching down, so you better not jerk the reins. That's also why you should not hold on to the outside rein. It can be good to use the outside rein in these circumstances, but there's a really slim chance they you will actually release it quickly and softly enough to get the desired effect. So leave it to begin with, and as both you and the horse learns to trust the stretch and to give, you can start using the uotside rein, for popping the shopulder back in line. The exercise can be alternated with moving the horse in a counterbent turn on the haunches, using only outside aids, instead. The horse counterbends because there are only outside aids, but it's OK. It's really about understanding the aids, rather than a perfect bend and outline.